San Francisco is worlds away from the war-torn nation of South Sudan where Hunter Dalli was raised. He grew up during the nation’s bloody civil war, which spanned 22 years. “We were always on the move to escape violence. There’s no childhood there, just violence,” he said. He fled his homeland to study in the U.S. on an international student visa and enrolled at San Francisco State University in 2017. Now he’s hoping his degree will further the child-protection and peacekeeping work he did back home. Dalli chose information systems as his major because he wants to develop an app that could reconnect parents to their missing or kidnapped children — a horror he witnessed firsthand, he says. 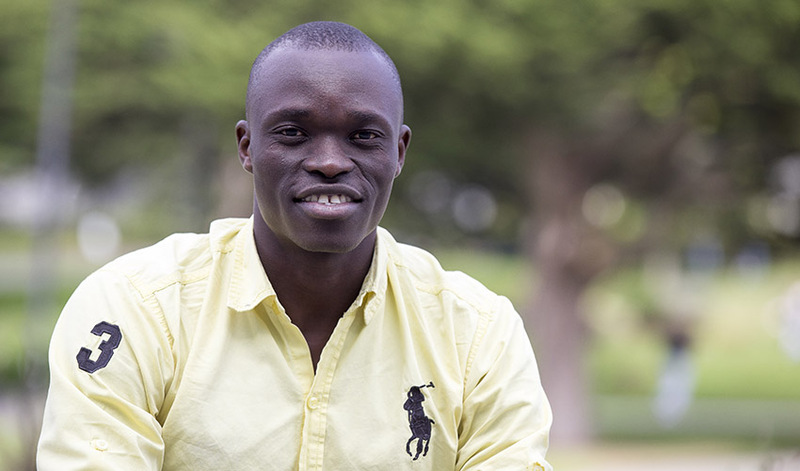 After working as a national protection officer with Nonviolent Peaceforce in South Sudan, a nonprofit that trains civilians to become peacekeepers in war-ravaged regions, he wanted to meet the need with an app. He first joined the organization at 23 because he wanted to find peaceful solutions to the ongoing conflicts that plagued his community. One of his last assignments before moving to the U.S. was to negotiate the release of 28 children who were kidnapped and conscripted into an army by a local warlord. Dalli was able to connect with the leader of the armed group, says Amy Hansen, a Nonviolent Peaceforce donor relations officer. After months of talks, he finally made a convincing appeal. “Dalli told the leader, ‘I’m South Sudanese and I know you’re fighting for your community, but if you keep these children who can’t even carry a gun, they’re just going to get killed,’” she said. “Finally, Dalli said, ‘If you let them go they can go to school and study and later they can represent your movement to the international community.’” That registered; the warlord then released the children, who had been in his army for five months. After the children were freed, the nonprofit could only reunite some of the children with their parents, Dalli says. Families are hard to track down because they’re constantly on the move seeking safety. And then the children often bounce from refugee camp to refugee camp. Dalli is focused on completing his degree, which he hopes to do by Fall 2019. He hasn’t had time to pitch his app to developers or investors, but plans to do so in the future because he sees a broader need for this type of technology.